My Impressions on "Miss Sherlock"
I give my impressions on "Miss Sherlock" as I watched all of the episodes. In it, the affair in the first episode based on "A Study in Scarlet" is solved in the final episode based on "The Final Problem". Unlike the other adaptions of "Sherlock Holmes", incidents don't occur in the darkness of London but in current Tokyo. The series seems to be the mixture of Japanese detective dramas and the eccentricity of Sherlock Holmes. Besides some characters and the development of the story remind me of those in "Aibou (aibō)" (*), a popular detective drama series in Japan. Wato Tachibana who is based on John Hamish Watson returns from Syria where she visited as volunteer doctor and encounters a murder at Tokyo International airport. After that she becomes to live with Miss Sherlock because of the fire of the hotel she stays. Personally, I think it's too good to be true. Anyway Wato helps Sherlock to crack a criminal case while being confused by her strange behaviours. Then she resigns as doctor and works as temporary staff of a library and waitress of a Japanese restaurant but what she does after that is not described. As some people around her are suspicious, she is not a storyteller like Watson in the original works but can be called a kind of victim. Both Sherlock and Wato are in danger in the final episode and Sherlock reveals a string puller at last. Besides Sherlock declares that Wato is her friend though she has insisted that she is not her friend many times. She changes indeed and her words reminds me of those of Holmes in "Sherlock Holmes", a puppetry written by Kōki Mitani. In it, he finally admits that he is a child (**) though he once told Watson that he was not a child any more. I hope you will enjoy it if you get the opportunity and I'll leave the last scene to your imagination. (*) Ran Itō, who acts Kimié Hatano based on Mrs.Hudson is a wife of Yutaka Mizutani who plays the role of Ukyō Sugishita in "Aibou". (**) Holmes is a 15-year-old boy in the puppetry. KOMATSU Tatewaki Kiyokado was a samurai who served Satuma domain. He was born in 1835 as a son of KIMOTSUKI Kaneyoshi who ruled Kiire, a part of current Kagoshima City. Though having bee delicate, he studied hard while learning swordsmanship. In 1856, he married KOMATSU Chika, younger sister of Komatsu Kiyomoto and was adopted by him. Then he called himself Komatsu Tatewaki Kiyokado. In 1861, he made an official trip to Nagasaki and mastered the skills concerning Western navy and it made him appoint to one of the close advisers of SHIMAZU Hisamitsu. So he reformed the government of Satsuma domain with ŌKUBO Ichizō, his subordinate and played an important roles for the domain includes the negotiation of Satchō-domei (Satchō Alliance). He was familiar with SAKAMOTO Ryōma. He also made ITŌ Hirobumi (Shunsuke) and INOUE Kaoru (Bunta) meet Thomas Blake Glover in the residence of Satuma in Nagasaki. Beside he acted as go-between Satsuma and the United Kingdom. Then he involved in Taisei Hōkan, the restoration of the government to the crown and mainly worked as diplomat in the Meiji Government. He was awarded for the efforts in the Meiji Restoration. But around that time, he ruined his health and consulted Antonius Franciscus Bauduin. He planned to return his fief because of illness and Hanseki Hōkan, the system of returning fief and people to the emperor administered just at that moment. In the same year he moved to Osaka to recuperate as the tumor in his lower abdomen got worse. In July 1870, he died in Osaka. His ashes were moved to the grave of his family in Kagoshima six years later. He was a good-natured and popular man. His descendants now manage a food company Tokiwaken. In this series, he is described as an able and bright man. He always tackles many problems with Ōkubo Ichizō (*) so they are high favour with their lord Hisamitsu. 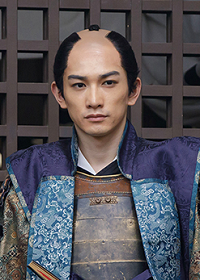 (*) Eita, who plays the role of Ichizo acts Tatewaki in "Atsuhime" broadcast in 2008. Both of the images are from the official website of "Segodon". He was born as KITAMURA Kamenoshin in 1817. His father was a lower-class samurai of Chōshū domain. In 1817, he was adopted by KIJIMA Matabei and trained swordsmanship. In 1848, he took over the head of the Kijima family. After the death of his adopted father, he called himself Kijima Matabei Masahisa after him. In 1848, he goes to Kyoto with sogeki-tai, a corps of hunters but was exiled from Kyoto because of "Hachigatsu Ju-hachi nichi no Seihen" (*). Then he formed yūgeki-tai, a kind of corps consisted of the soldiers from various social classes. 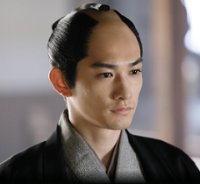 In 1864, he goes to Kyoto again to clear the name of Chōshū domain and planned to kill SHIMAZU Hisamitsu but in vain. He once returned to Chōshū and urged his lord Mōri Takachika to dispatch the troops to Kyoto. And he went to the capital again with his comrade-in-arms includes KUSAKA Genzui. On the 19th of July, the Kinmon Incident occurred and he fought bravely against the Satsuma Army. But he was shot in the chest by KUWAJI Toshiyoshi and then killed himself. His son Kamenosuke changed his family name by order of Takachika and married one of the younger sisters of INOUE Kaoru later. 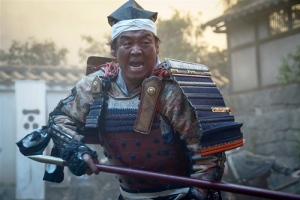 In this series, he is described as a daring samurai who tries to break through the deference of the Satsuma Army at the Hamaguri Gate. He side-hands his enemies and advances but is shot to death by KAWAJI Toshiyoshi. (*) It means "the coup of the 18th of August". It caused the exile of the aristocrats who are close to the radical royalists of Chōshū domain and the royalists were exiled also. From this, the aristocrats who supported "kōbu gattai ron", the cooperation of the Imperial Court and the shogunate had influence in the court. (**) He is a famous professional wrestler from Yamaguchi, Chōshū in former times so his ring name is taken from it.